One of the great dames of film noir, and quite a bit more, Ida Lupino was born in London in 1918. Her father was Stanley Lupino, a star of the West End stage who wrote many of the productions in which he appeared. Lupino Lane, an important British music hall star, was a cousin. And Ida's mother, Connie, was an actress. Of her father Ida Lupino once said, "I knew it would break his heart if I didn't go into the business," and so she did, even though her first love was writing. Her first credited film was Allan Dwan's Her First Affaire (1933). It was an ingenue part and an inaccurate industry myth had it that her mother read for the part but lost it to young Ida [thanks to Jean Howard for clarifying this]. In any case, the role led to several screen appearances in quick succession. By year's end she was signed by Paramount Pictures and headed from London to Hollywood. She was to star in Alice in Wonderland, but that didn't pan out. Only 15, Ida seemed mature beyond her years and lost the part. She made several mostly forgotten films, endured a battle with polio and resumed her career. 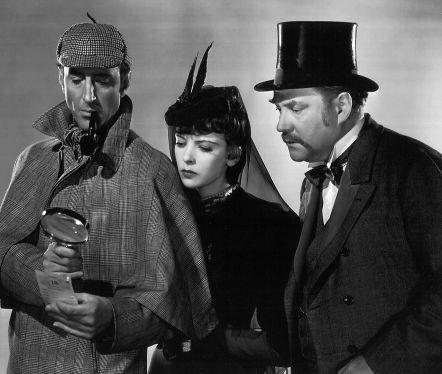 With The Adventures of Sherlock Holmes (1939) she was noticed in a role that provided an opportunity to demonstrate her range. William Wellman's The Light That Failed (1940) was her first real break. Though no one had wanted her in a part considered unsympathetic, Lupino pursued the role and in the end it brought her fame. She soon moved on to Warner Bros. and it was here her reputation as a dame-of-noir began with her fiery performance as Lana Carlsen in They Drive by Night (1940). High Sierra (1941) and The Sea Wolf (1941) quickly followed and her value to Warners was established. However, with Bette Davis the reigning queen of the lot, Ida Lupino was frequently assigned films the great star had passed on. Referring to herself as "the poor man's Bette Davis," she spent a good amount of time on suspension from the studio for refusing roles she considered unworthy. Fortunately, she accepted the part of driven, manipulative Helen Chernen in The Hard Way (1943); for her performance she received the New York Drama Critics' Best Actress Award. During this time, Lupino was married to actor Louis Hayward (Anthony Adverse, The Man in the Iron Mask). Hayward enlisted in the Marines at the onset of World War II and commanded the photographic unit that filmed the battle of Tarawa (November 1943). The film won a Best Documentary Short Subject Oscar but the experience of the bloody four-day battle left Hayward badly shell-shocked and the couple split up. Although Lupino's acting career continued, it was during a lengthy studio suspension in the mid-'40s that she started thinking seriously about directing. She married producer Collier Young in 1948 and in 1949 they put together an independent production company called Emerald Productions, later rechristened The Filmakers. 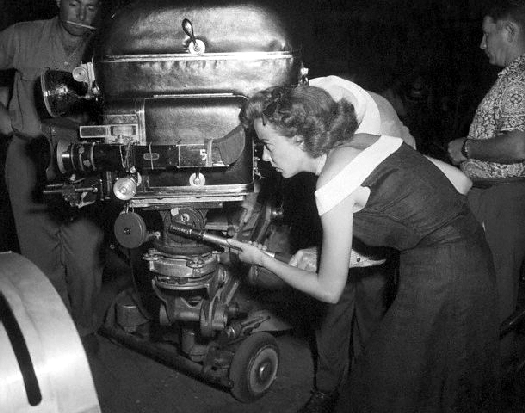 ﻿ The company's first effort, Not Wanted (1949), featured a screenplay by Ida Lupino and was to be directed by Elmer Clifton. A few days into shooting Clifton suffered a heart attack and the actress stepped in to finish the film (but gave the credit to Clifton). Co-starring with Sally Forrest, a young actress Lupino would tap again, was Leo Penn an actor/director now best known as the father of Sean Penn. The film, like most Lupino directed, broached a ticklish subject for the time - unwanted pregnancy. Three low-budget, Lupino-directed classics came out of The Filmakers: Hard, Fast and Beautiful (1951) with Claire Trevor and Sally Forrest, The Hitch-Hiker (1953) with Edmond O'Brien and William Talman and The Bigamist (1953) with Edmond O'Brien, Joan Fontaine and Lupino herself. In the meantime, Lupino also co-starred with Robert Ryan in Nicholas Ray's powerful On Dangerous Ground (1952) and reportedly directed some of the film while Ray was ill.
By the time the last three Filmaker efforts were produced, Ida Lupino and Collier Young had divorced. Lupino married actor Howard Duff not long after. In 1954, The Filmakers dissolved but Lupino later found herself in demand to direct for TV. Over the next few decades she directed dozens of episodes for series television, including "Alfred Hitchcock Presents, "The Twilight Zone" and "The Untouchables." At the same time she continued to act in film and on television; she and Howard Duff starred in a very popular TV series, "Mr. Adams and Eve" from 1957 - 1958, and Lupino was nominated for Best Actress Emmys for both seasons of the show. ﻿ Busy with television, Lupino directed only one more theatrical film, The Trouble with Angels (1966), a comedy starring Rosalind Russell and Hayley Mills. 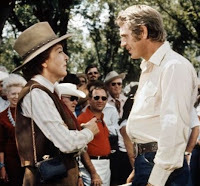 She didn't appear in many films at this point, but her later film career included an exceptional turn as Steve McQueen's mother in Junior Bonner (1972). Onscreen, Ida Lupino was an edgy combination of tough and tender and is remembered as one of the legendary actresses of film noir. Behind the camera, she developed a hard-boiled, suspenseful style while working on tight schedules with small budgets. Today she is not only honored as a pioneering "woman director," but is also an acknowledged auteur of the early 1950s. Over at Jean Howard's blog, Discovering Ida, which is basically all about Ida Lupino, she told me that she thought," The Hard Way" was based upon Ginger's relationship with Jack Pepper. It's not mentioned in her autobiography, but do you know anything about it yourself? This was a great read, and I look forward to reading more! A great look at a wonderful actress and director. Along with Stanwyck and Joan Blondell, Ida Lupino is one of my favorites. For me, it was “High Sierra” and “They Drive by Night” where I first noticed Lupino so many years ago. The films were staples on one of the local stations on a Sunday afternoon. You captured her perfectly in describing her screen persona as “tough and tender.” She was terrific in “On Dangerous Ground,” “Beware, My Lovely,” “Road House,” “The Sea Wolf,” “The Hard Way” and “Out of the Fog” just to name a few. In “Women’s Prison” she hams it up playing the archetypical despicable warden. Not a great film but a fun one. Her direction of “The Hitch-hiker” shows she can handle the gritty world of noir from behind the camera as well. John - I'm not surprised at all to find out you are a big Ida Lupino fan. She's been high on my list since those b&w TV days. Just recently saw "Moontide" for the first time (couldn't resist the draw of Lupino/Gabin). Also watched "On Dangerous Ground" again. Can't get enough Ida Lupino these days. In Aug/Sept. 2010, NYC's MOMA presented a program of Lupino films, "Mother Directs"...Ida more than deserved the honor. I was first introduced to Ida Lupino in the I Love Lucy episode she starred in with Duff. I was a teenager and had no idea who she was at the time! Not long after, I saw High Sierra and thought she looked familiar--I didn't make the connection at first. I had no idea she was also one of the rare female directors in classic Hollywood until years later. She was just brilliant all around. 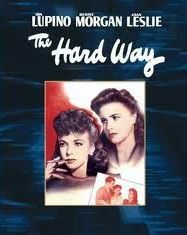 And this post reminds me that I am dying to see The Hard Way--it's been on my "must-watch" list for a while now. Eve, a great post on my #1 neglected actress of the forties. I absolutely agree with you about her performance in "Road House" being so great--my personal favorite of her many fine performances. I had known of her for years, but this was the performance that really brought her to my attention. Another great performance of that era is in "The Man I Love," a noirish musical directed by Raoul Walsh in which she also plays a night club singer and sings (actually, I think her voice was dubbed) two fantastic songs: the title song by the Gershwins and Jerome Kern's "Why Was I Born?" This is the musical Martin Scorsese says inspired "New York, New York." Another great performance from earlier in the forties is in "Ladies in Retirement," a Hitchcock-like shocker that costars Elsa Lanchester and Louis Hayward. About "They Drive by Night." This was a semi-remake of "Bordertown," and she took the role Bette Davis played in the original. As much as I love Davis (my favorite film actress of all time), I think Lupino did the better job, especially in her big courtroom meltdown scene, which is far more nuanced than Davis's version. By the way, after they divorced, Collier Young married Joan Fontaine, and they were married at the time Lupino directed and costarred with her in "The Bigamist," which Young produced. If you've read Fontaine's autobiography, you know she has few kind words for anyone, but apparently she and Lupino were great friends. I guess one big ego recognized and respected another. I got the same impression about her and Lucy from the "Lucy-Desi Comedy Hour" episode Brandie mentions. She had a couple of good roles in the fifties for noir directors Robert Aldrich in "The Big Knife," in which she looks sensational, and Fritz Lang in "While the City Sleeps." I just saw "The Love Parade" the other night and finally got to see her father (whom she idolized), who's usually described as a diminutive acrobatic music hall singer-comedian. He was! Thanks for bringing attention to a neglected actress and film noir mainstay (even though she isn't often thought of in this way) who certainly deserves it. thank GOD someone mentioned THE MAN I LOVE...or I was gonna scream...I too grew up with IDA...from her early films...the NOIRS...Television...am a huge fan...thanx EVE!!! Lady Eve, you have written a graceful tribute to a graceful lady. One of many reasons why I admire Ida Lupino is a career that spanned decades, in films and television, as actress and director. My first introduction to her work was most likely DEVOTION during my “all things Bronte” phase. I gradually discovered many of her other films that became favorites including THE HARD WAY and ROAD HOUSE. Her role as a torch singer is nicely rounded-out by Celeste Holm’s comment, “She does more with nothing than anyone I’ve ever heard.” I agree with R.D. regarding a preference for Ida in THEY DRIVE BY NIGHT over Bette in BORDERTOWN; Ida’s choices for the character resulted in a subtler performance. I just ordered "Bordertown" and "They Drive By Night" from one of my libraries - didn't realize the two films were related and want to see them back-to-back. Also ordered "The Man I Love." Bette Davis is my all-time favorite, too, R.D., and I didn't realize until researching for this post that her stature at Warners was an obstacle to Ida Lupino's career there. Ida was quoted as saying that Jack Warner once told her to just wait, when Davis got older (she was 10 yrs. older than Lupino), Ida would get the plum roles. She realized, of course, the same would apply to her one day. A smart woman all the way around. What a fabulous entry! Ida was terrific in all the films you mentioned; such a talented actress, and a very talented director, too. I love the films she directed, particularly The Bigamist. However, that bit about Ida being chosen for the lead role in Her First Affaire actually isn't true--I know you read that everywhere, but it's just a rumor that's been circulating for years. Would you mind if I promote this post over at my blog? Hello Jean...love your blog & am following you on Twitter now. Would be very happy if you'd promote this post at your blog. How interesting (and unfortunate, it's a fascinating story) that the legend about Ida's selection for "Her First Affaire" is just a tale. I trusted the source as it had appeared in print, a respected classic film journal. Eve, I've been so busy I am late commenting on your excellent review of Ida Lupino's remarkable career. As an actress, she was luminous in roles like High Sierra, Devotion, The Hard Way and Beware My Lovely. I have not seen some of the films you disucss, and would like to very much. I think High Sierra stands out for me -- she more than held her own with Bogart. She was just wonderful. I love Devotion, a very romanticized version of the Bronte sisters' lives, but a lovely atmospheric movie with Ida out-shining everyone as Emily. Even with all that to her credit, women everywhere owe her a debt of gratitude for opening up the role of the woman director. She is just an admirable person, and one of my favorite women. Thanks for a very informative and interesting article about remarkable Ida! Eve, I really enjoyed reading your terrific review. 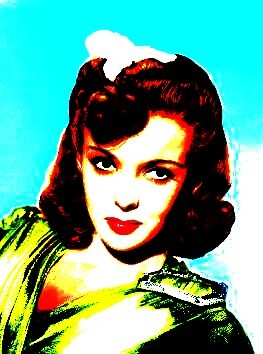 What a talented woman Ida Lupino was. 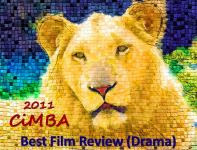 I was very impressed to learn while I was writing her bio, that she was also a director. Amazing.. I loved her performances in the films: 1940 They Drive by Night, 1941 High Sierra, Escape Me Never and 1972 Junior Bonner.